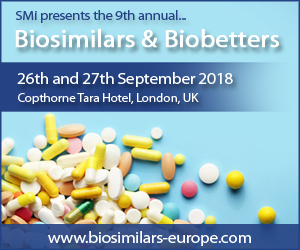 SMi Group is proud to announce the return of the 9th annual Biosimilars and Biobetters conference, taking place on the 26th and 27th September 2018 in London, UK. Registration for the event is now open and the newly released brochure is available to download from the event website. This year’s conference will have a focus on forecasting the next wave of biosimilars to ensure optimal market commercialisation. The two-day event promises a diverse expert speaker line-up and will bring together a global audience of biosimilar experts to discuss the latest developments, as well as the future of the rapidly evolving and expanding biosimilars market. After many years of rejection, the biosimilars industry is finally reaching a stage where key stakeholders understand and accept biosimilars, as seen in more tolerant legislation and increased use and approval of biosimilars across the globe. Biosimilars and Biobetters 2018 will explore the thoughts of industry thought leaders and assess the success of marketed biosimilars, as well as discussing the current attitudes of potential customers, prescribers and patients towards biosimilars and biobetters.